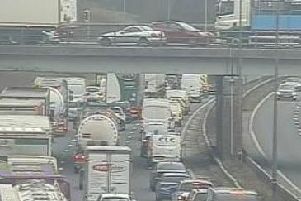 A collision on the M6 southbound near Wigan has forced police to close two of three lanes. The accident happened between junctions 24 in Ashton-in-Makerfield and 23 in Haydock at around 1.20pm. Police briefly closed lanes 2 and 3 to allow the stranded vehicles to be recovered. The lanes have been reopened, but lane 1 has now been closed to allow the stricken vehicles to be moved safely from the hard shoulder. Highways are reminding drivers to obey the closure signals which have been put in place on the approach. 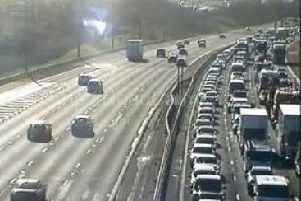 A collision on the M6 southbound between junctions 24 (Ashton-in-Makerfield) and 23 (Haydock) is causing delays after a two-lane closure was put in place. The collision came just minutes after the M6 reopened after an earlier crash near Wigan closed the carriageway for seven hours.